It’s that time of the year again to make merry and throw caution to the wind, while indulging in a little holiday fun and feasting. But here’s the question: where can one find the best festive eats and, more importantly, the best settings to enjoy the celebrations with family, friends and colleagues? Look no further than Shangri-La Hotel, Singapore for everything you desire. The Line’s 16 theatre kitchens offer highlights such as roasted turkey, lobster coconut curry and Christmas macaron tower, just to name a few, while the live outdoor BBQ station serves tantalising festive meats. Sit down to a couple’s meal at Origin Grill, which has specially curated Christmas Eve and New Year’s Eve menus that showcase fresh, authentic flavours and local ingredients. You can also look forward to chef Heidi Flanagan’s unique take on traditional classics such as acquerello-aged risotto and pan-seared halibut. Special festive menus are also available at Shang Palace, Nami and Waterfall Ristorante Italiano, each offering a unique take on festive indulgence. There won’t be turkey on the table, but plenty of other dishes that will be just as hearty and delectable. 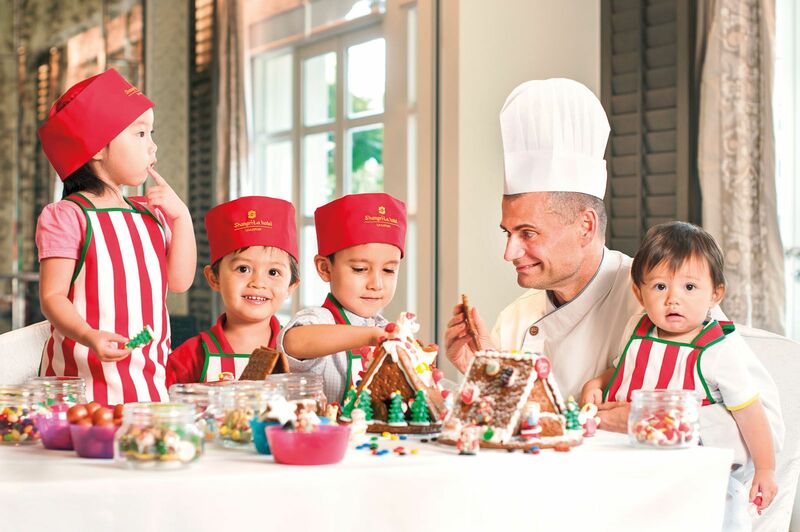 Unleash the creativity of your little ones with the activities at Buds by Shangri‑La. From December 22 to January 1, 2019 children can craft their own Christmas ornament at the Garden Terrace, listen to magical tales at Muddy, and even create a tree-shaped brownie at Bake. The Gingerbread House Children’s Workshop will be held on weekends between November 24 and December 16, with two sessions available every day. Join the kids in this creative endeavour and build a personalised confectionery masterpiece. Who can say no to log cake? Get yours from the Shophouse. There’s a traditional Yule log and a chendol, coconut and red bean version for a local twist. And you won’t go wrong with its premium hampers, with prices starting from $108++. Take your pick from Season’s Treats, Santa’s Hamper or Joyful Cheers. Get all dressed up and groove into 2019 at The Lobby Lounge’s Masquerade Party on New Year’s Eve. Attendees stand a chance to win a one‑night stay in the hotel’s Grand Suite. The bash starts from 9.30pm till to 2am.